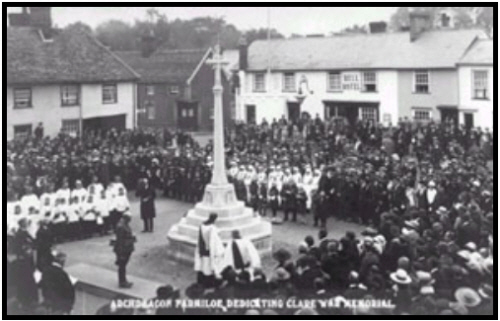 The Clare war memorial, standing in the Market Square, Clare, is around 20 feet hight in total. It is a Clipsham stone Celtic cross on a tall tapering pillar, on an square plinth atop a four stepped octagonal base surrounded by metal railings. 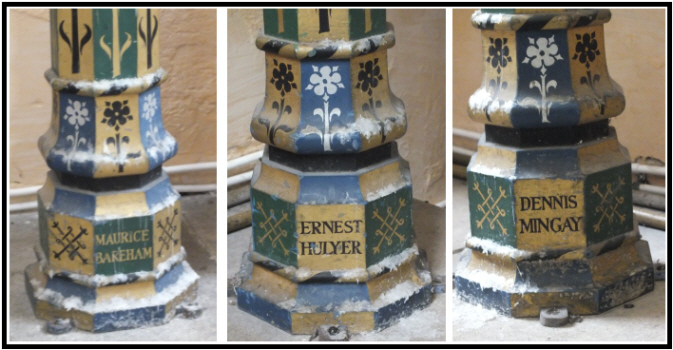 On the four faces of the plinth are inscribed four shields, featuring the Arms of Clare, The Suffolk Regiment, St.Edmund and of St.George. On the faces of the top three steps are inscribed ( and black painted) the names of the fallen and dedications. On the bottom step the faces are decorated with flints. 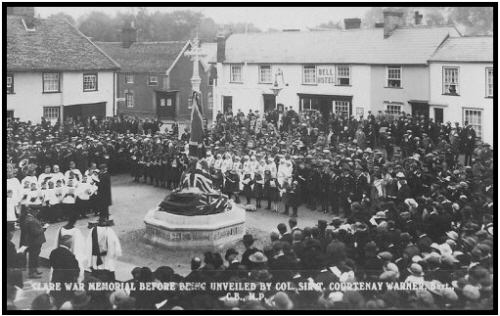 The memorial was unveiled by Colonel, Sir Courtenay Warner Bart., and dedicated by Canon W.T.Farmilae on 23rd October 1921. Rededicated in 1948, in 2010 a grant was given by the War Memorial Trust of £2,945 towards the total cost of £5,897 for repairs and renovation of the memorial. 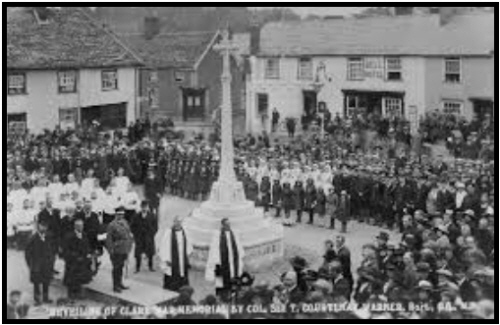 In respect of the spirit in which the inhabitants of this ancient town have commemorated their fallen sons, and the tangible form they have given to it.Clare will certainly bear comparison with many larger and more important centre in the Eastern Counties. The memorial, which was unveiled on Sunday by the Lord-Lieutenant, Sir Courtenay T.Warner is certainly elegant in design, and while in harmony with the surroundings, will, in the days to come, remain a conspicuous reminder of the Great War, and of those who laid down their lives in the cause of freedom and justice. 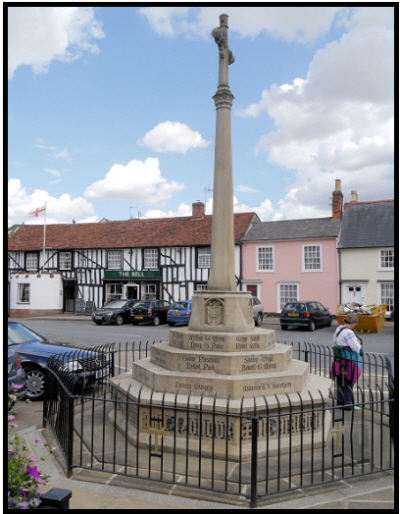 The cross, of fine properties and with elaborate ornamentation both at the base and the summit, stands in the Market PLace, in a picturesque setting as regards the ancient houses, and is of Clipsham stone. it is some 19 feet in height. 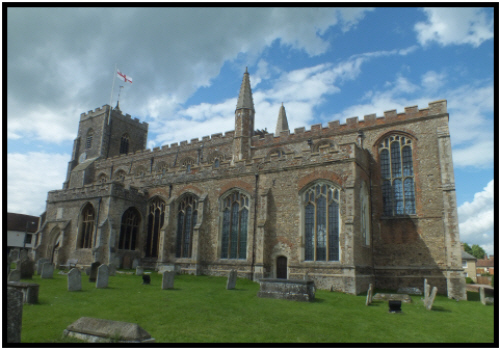 Four panels bear the Arms of Clare, of the Suffolk Regiment and of St Edmund and St.George. 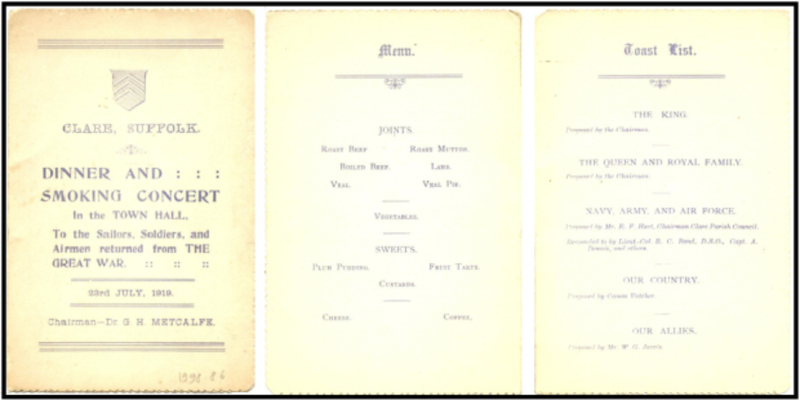 The inscription,"In grateful memory of the men of Clare who ell in the Great War, 1914-1918. They died for freedom and honour", which runs round the base, is in Old English lettering set off by dark flints, and is in effective contrast. The flints were taken from Lady May's estate in Clare. 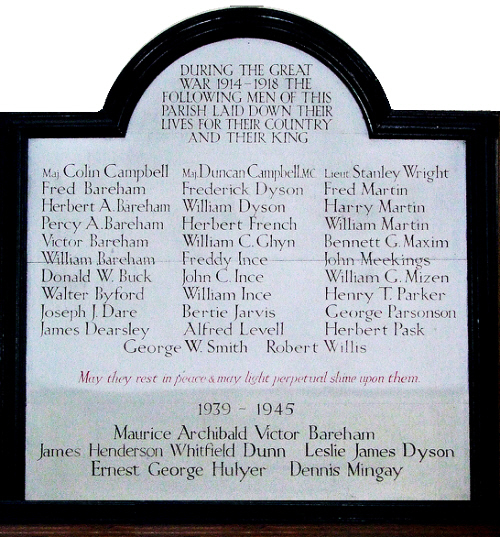 The fiollowiog names of the departed are engraved on a prominent part of the memorial: Fred Bareham, Herbert A.Bareham, Percy A.Bareham, Victor Bareham, William Bareham, Donald W Buck, Walter Byford, Colin Campbell, Duncan Campbell, Joseph J.Dare, James Dearsley, Frederick Dyson, William Dyson, Herbert French, William C.Ghyrn, Freddy Ince, John C.Ince, William Ince, Bertie Jarvis, Alfred Levell, Fred martin, Harry Martin, William Martin, Bennett G.Maxim, John Meekings, William G.Mizon, Henry T.Parker, George Parsonson, Herbert Pask, George Smith, Robert Willis and E Stanley Wright. The square now being used as a car park makes it almost impossible to get a good clear photo of the monument,and also the stone is very dark, which does not help read the names.The monument was extensively renovated around 2013, much stone work being restored and the names re-painted in black. The stained glass window to the right of this roll of honour is also a memorial to the war dead. In a glass case under the roll of honour is a book listing all those from Clare who served.